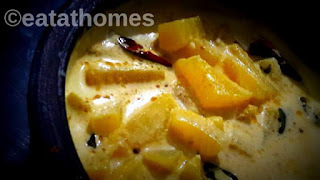 A simple Vegetarian Indian Curry that is a daily cooked in many Kerala households. Morru means curd/ dahi, recipe is similar to Gujarati Dahi Curry. gujrati dahi curry made with Besan+ curd and Morru curry is combination with curd & Coconut milk…..both are best with Rice Combo. cut winter melon into medium sized pieces. Cook it with turmeric powder, red chilly powder, salt and water. Grind grated coconut with shallots, cumin seeds and green chillies. Add the ground coconut mixture to the cooked winter melon. Allow it to cook in a low flame.